You are here: Home › Do You Know Carlsen? 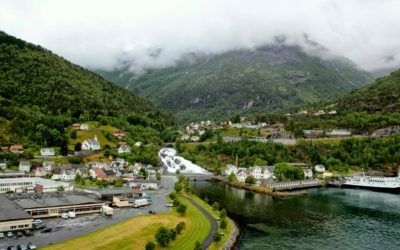 I was in Hellesylt, Norway with its gorgeous waterfall that divided the town in half. This occurred during the Norway Chess event. When I left the ship, I asked the Cruise Director where I might find the elementary school. She pointed to a white building near the dock. I easily found the road to the building and walked inside to locate the office. There were two students whom I observed just inside the entrance. Since I did not speak Norwegian I tried to keep it simple. I said, “Office?” They both looked at me and then looked at each other. No success. I have left chess sets in many parts of the world including the Amazon, India, South Africa, Peru, Egypt, Guatemala, China, Sicily, Myanmar, Nepal, Kenya and Botswana. Now, there is one residing in Norway. This makes my wife happy because it creates some extra room in my suitcase for some souvenirs.